The schedule for the Fifth Annual EARS Graduate Student Conference is now available! 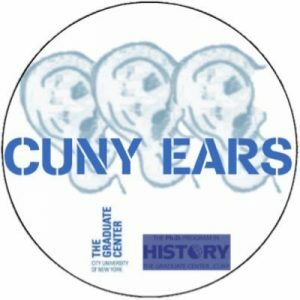 The City University of New York Early American Republic Seminar (CUNY EARS) is a student-run seminar founded in 2010 to foster conversations on the history of the United States from its founding through the Civil War. Throughout the academic year we host workshops of works-in-progress by graduate students and established scholars from a wide range of disciplines including history, legal studies, literature and American studies. If you have any questions or interest in our group, email the 2018/2019 co-chairs Cody Nager and Evan Turiano. You can also find EARS on twitter. The Ph.D. Program in History at the Graduate Center, CUNY, is a major center for research and graduate training in a wide array of fields of historical inquiry, ranging from ancient to contemporary times and covering Europe, the Americas, and the Middle East. The program stresses training in primary research and encourages interdisciplinary study. The distinguished faculty, consisting of more than 70 respected historians, works closely with the approximately 125 students throughout their studies at the Graduate Center. For more information on the History program at the Graduate Center, visit http://www.gc.cuny.edu/history.